Energize Mineral Bath is an invigorating blend with aromas of peppermint, juniper berry, rosemary, cinnamon leaf and sweet basil. Buy 1 for $4.49Buy 2 / Save $0.24!Buy 3 / Save $0.90! 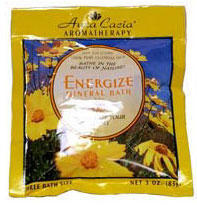 Size (inches): 0.39" X 4.33" X 5.31"
Experience the luxury of Aura Cacia's aromatherapy mineral baths. The pure essential oils of natural botanicals offer a variety of benefits- enhancing and balancing your mind, body and spirit. Our unique blend of ocean and desert salts, generously scented with 100% pure essential oils, will give you softer feeling skin and soothe your soul. Indulge yourself an discover the benefits of Aura Cacia aromatherapy.Aura Cacia offers a choice of more than ten aromatherapy mineral baths, as well as a wide variety of other natural aromatherapy products: 100% pure essential oils and essential oil blends, body oils and soaps. Immerse yourself in the natural beauty of Aura Cacia. Pour desired amount into bath under running water. Sodium Borate (desert salt), Sodium Chloride (sea salt), Sodium Bicarbonate (soda ash), Essential Oils (lemon, peppermint rosemary, sweet orange).. Founded in 1984 in the Trinity Mountains of north central California, Aura Cacia is a leading manufacturer of 100% pure and natural essential oils and quality aromatherapy products. Aura Cacia offers more than 80 essential oils that create moods such as relaxation, rejuvenation and sensuality. Essential oils from Aura Cacia are 100% pure botanical oils without any added water, alcohol or other diluting agents. These aromatic oils are generally steam-distilled from herbs, fruits and flowers. Citrus fruit essential oils are cold-expressed. No animals are used to test Aura Cacia products. The products are biodegradable.